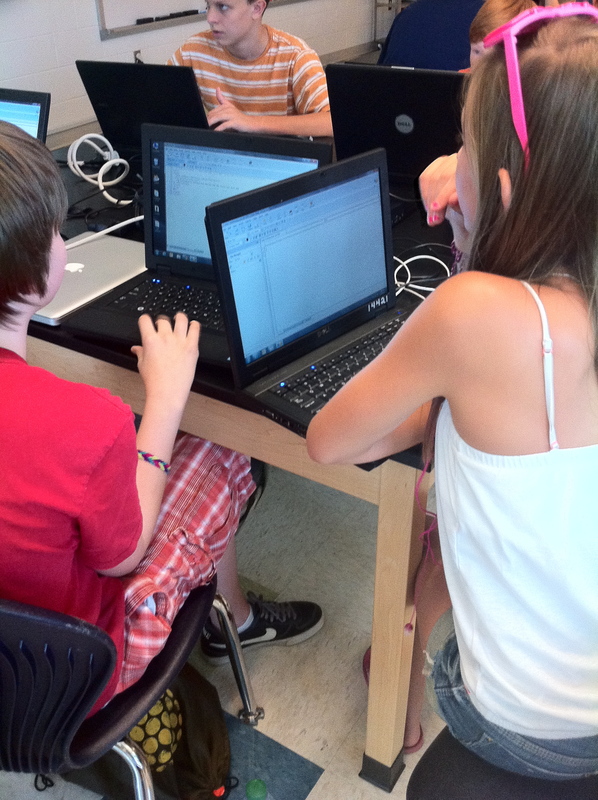 The following post contains background on the Coder Dojo program underway in Albemarle County Public Schools and a guest post by Scratch programming enthusiast Eileen who attends Broadus Wood Elementary. If you would like to know more about our plans for our new round of Coder Dojo sessions or to volunteer to help, click here. Eileen’s page also has a link where you can download Scratch for free and see her original post as well. If you want to make your creations come to life, then Scratch is the website for you. You can make hundreds of different characters, and make them walk, talk and move in any kind of way. You don’t have to make characters, you can also make Movies,animated pictures,games, and puzzles! Scratch is an around-the-globe website, so anybody can play it! The cool thing about it is, if you like your creation, you can publish it online so the whole world can see it. You have to download this site, but its free, so there’s really nothing to it. It only takes a few seconds to download this site, so don’t plan anything ahead of time. I highly recommend Scratch, it is a fun, educational website. I am excited to hear about your creations, and if you can, post your creations on this blog, so I can see what you have created! Scratch is a fun website, and I hope you can get it. This summer, Albemarle learners, ages 7 – 18, participated in our four-day Coder Dojo Academy where they learned basic to advanced programming skills. The Coder Dojo movement began in Ireland and rapidly spread around the world. Albemarle County Public Schools is one of the first divisions in the United States to sponsor Coder Dojos for our young people. We were surprised at the significant interest this summer from our families because we rolled the invite out towards the end of the summer and knew many children were already in activities or on vacation. We hoped to attract interest from 40-50 kids, but ended up with 900 on a waiting list, and expanded up our AHS program and served 200. The kids were amazing, coming in with little to no programming knowledge to knowing more than some of our teacher-facilitators. The Dojo is designed so that kids learn from the teachers as they have questions and often from each other in this multi-age setting. I watched elementary children teaching middle schoolers how to make Scratch games and high schoolers taking the time to help younger children with HTML so they could design, create, and publish web pages. The purpose of the Coder Dojo movement is to provide young people with opportunities to experience computer programming as fun and something they can learn to do. Kids at the camp used a variety of languages to build more and less sophisticated projects. One parent of a high schooler said to me recently, “his participation in the Coder Dojo changed his life. He’s really interested in continuing to pursue computer programming now that he’s back in school and he spends time teaching himself what he needs to do.” Some elementary children felt the same way, too. Melissa Techman, librarian at Broadus Elementary, sent me the link to the blog post written by Eileen, which I’ve guest-posted with her parents’ and her permission. Thank you, Eileen, for helping me share how Scratch which was developed at the Massachusetts Institute of Technology (MIT) can turn kids who like to play computer games into kids who make computer games!